Whoever said that fruit can’t dance with savory flavors has yet to meet me. As you know from reading past entries, I’m all about sticking figs where they don’t belong, infusing soups with citrus flair, and yes–even icing cream with succulent red strawberries and coriander powder. Naan pizza: light, fresh, easy. Grab some whole wheat naan from your local grocery store (incidentally, just about the right size for a single serving of pizza or for two if serving with salad). Grab a few crazy toppings. Go home. Go to town! 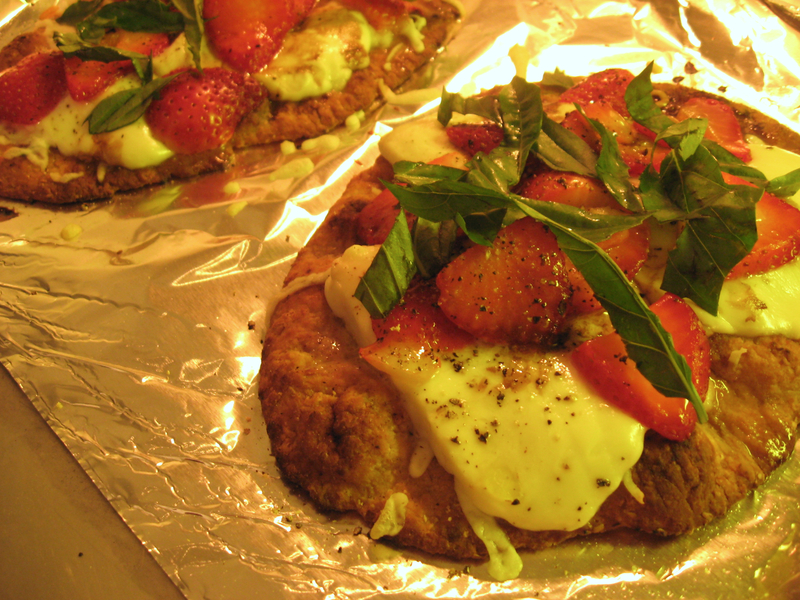 In this pizza, I desecrate the sacred trinity of mozzarella, tomato, and basil by exorcising the tomato from the picture altogether (which, by the way, is a FRUIT–take that, fruit haters!). Instead, I slice up some plump, luscious, ruby red strawberries bursting with flavor and add them to the mix. Here’s the recipe. So fast, so easy, low on grease and high on flavor. You’ll never want to order pizza again! For more delicious pizza recipes, try our New Orleans Crab Bechamel Pizza from Students Go Gourmet, the first cookbook written by me and my amazing aunt, Doc Ellen! Drizzle some olive oil onto the naan, then pre-bake in the oven at 400 degrees F (or whatever temperature package directions indicate) for about 8 minutes, until firm and crispy (but not too brown!). Place a generous layer of the shredded mozzarella on the baked naan, just enough to cover the surface. Next, place the slices of mozzarella di bufala over the top, making sure not to overcrowd the surface. We want to leave room for strawberries! Add the thinly sliced strawberries to the remaining surface area (sure, you can cover a few pieces of the di bufala if you like). Bake in the oven for 6-10 minutes, until the cheese has melted and the naan has begun to brown. Remove, drizzle with olive oil and balsamic vinegar, top with the sliced basil, and crack some black pepper over the top.